Are friendships worth to put at stake for a piece of cake? Well, this is what I did. After I made this raw lemon cheesecake for the first time, I was so blown away by its flavors and textures, that I big-mouthedly promised sample pieces to neighbors and friends. They never reached their destination. Apart from one piece that I gave my husband to try, I had the whole cake by myself. It keeps very well in the fridge for a week. I still hesitate to call this a healthy cake. It's simply too good to be true. It's too delicious. But let's get down to the facts: It's vegan, gluten-free and grain-free. And it is made with natural raw ingredients only. It might have a little bit too much of everything, but it is without a doubt nutritious. The ingredients list is so incredibly simple. You might, in fact, have all of them in your pantry and could start making this cake right away. Perfect in the summer months, as the oven is not needed to make it. 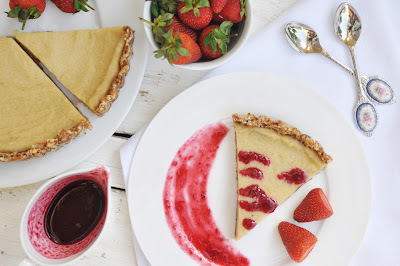 A piece of this cake with a drizzle of raspberry coulis (Ok ... this one is not as healthy and includes some stove top action), and you'll be nutritiously and deliciously in heaven. I hope, my friends and neighbors will forgive me. I will spend the rest of the day finding a suitable excuse. Or instead, just make another cake. Soak the cashew nuts in cold water for 4 hours. Rinse and drain. Set aside. For the crust, combine whole almonds, dried dates and coconut flakes in a food processor. Pulse until finely chopped and crumbly. It should stick together when pressed between two fingers. Add a tablespoon of water if it doesn't stick and blend again. Repeat if necessary. Make sure the dough doesn't get too wet. Combine drained cashews with lemon juice, coconut oil and syrup in the food processor and blend until it becomes smooth and creamy. Transfer mixture onto the crust in the cake pan. Spread evenly and smooth the top. Put the cake in the freezer for 1-2 hours, or until firm. Remove from freezer, and cut into slices while still frozen. Then keep in refrigerator for 1 hour to defrost or 20 minutes on counter top before serving. Serve with fresh berries and a drizzle of raspberry coulis. Combine the sugar and water in a small saucepan and bring to a boil over high heat. Reduce the heat to medium-low and simmer, stirring occasionally, until the sugar dissolves, about 3 minutes. Pour the syrup into a container and refrigerate until completely cold, about 45 minutes. The syrup can be stored in an air-tight container in the refrigerator for up to 1 week. For the coulis: Bring the raspberries, syrup, and lemon juice to a simmer in a heavy medium saucepan over low heat. Simmer, stirring occasionally, until the berries are very soft, about 8 minutes.